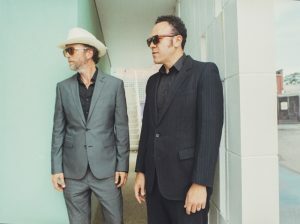 An Interview With The Austin Roots Trio, GREYHOUNDS! The Austin roots trio Greyhounds will be releasing their new album Cheyenne Valley Drive on April 13th. The first single “No Other Woman” recently premiered on Rolling Stone Country. 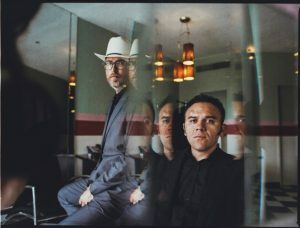 Greyhounds are the Austin trio of Anthony Farrell (vocals, keyboards), Andrew Trube (vocals and guitar) and Ed Miles (drums). Many music fans remember Farrell and Trube as key members of JJ Grey’s band MOFRO for many years. After parting with Grey in 2016 to focus full-time on Greyhounds, the band has only left the road to record and release two full-length records. Greyhounds recorded their forthcoming album at the legendary Sam Phillips Recording Studio in Memphis. This was the perfect place place to make the type of record Greyhounds were interested in making; a less produced, and more spontaneous style of recording, cut straight to tape like many of the classic music that was made there in its heyday Cheyenne Valley Drive is a product of a band at the height of their game, making music in a studio that has been virtually untouched by time, recording in the style that many of their musical heroes used. It’s been great so far. Busy SXSW and planing on being on the road for most of 18. Can you recall the moment when you all thought you could be in this band together? Was it hard to come up with a name that you all thought fit your sound and who you are? How much do you think you all have grown as a band since you first formed? What has remained the same about your dynamics? Literally we have grown ha ha. Farrell and I have been playing together since 1999. We listen to each other. It’s all about listening in life and in music. Anthony and I are brothers from another mother. What does it feel like to releasing your new album, “Cheyenne Valley Drive” next month? We have a catalog of tons of tunes. We went thru it to find the best songs for straight to 8 track tape live studio recording. Did anything surprise you about the overall process? How easy and liberating it’s is to not use a computer while recording . Commit and move on. What was the inspiration for the way you created it- cut straight to tape and less produced sound? It’s how we did our first record years ago. Raw and for real you hear all the blemishes and that’s the good stuff. Also that’s the work method of Sam Phillips recording studio. You have to come in tight and ready to lay it down. 13 songs in one day. While it may be hard, can you pick out of a few of your favorite songs on this forthcoming album and talk about how they were written and picked to be on this collection? WMD cuz it’s random but still a hounds tune. It’s about disillusionment of status. Basically we are all in this together and no one is safe from self doubt. We have to pull each other up. Everyone is important and special. Both are such different worlds but both are awesome worlds. Studio is more cerebral where as stage is so raw and in the moment. Best job ever. We are very lucky . With everything going on in the world today, how do you think your music is a reflection of these times? Again it’s all about lifting folks up. So much static and ego all we want to do is make people happy and maybe forget about negative things for a moment. The music community in Austin keeps me moving and inspired. So many incredible artists in Austin. We are very lucky to be a part of that. How important do you think social media has been to this band? Ha ha ha Not much now, we are too old. It’s a great way to touch base with folks. We stay more on Instagram. We just want everyone to be happy come together and realize were on this little ball together. We are all different and special in our own ways even if we don’t agree all the time we do agree in the power of love. It’s like Susan Tedeschi says after all her shows “everybody be good to each other, because we are all we got”. An Interview With The Fast-Rising LA-Based Singer-Songwriter EDDY FAULKNER On His Newest AirBnB Musical Partnership and Much More!